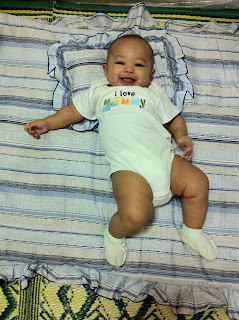 Major milestone - Officially boleh meniarap at 4months day old. Yippie Yey! Giggles a lot when her daddy do funny faces or making fun of her. I notice, a simple hee-hee sounds already could makes her laugh out loud. I bought her squeak toys at 3months old but she hardly focus on it but now she utilized it by grabbing and exploring the toys for a few minutes which normally would end up into her mouth -_-"
She already started grubbing her gum which caused her drooling all the time. Kalau ade kain kat tangan tu, memang basahlah dengan air liur die. Kalau di sua jari kat mulut die, mmg die akan gigit dengan bersungguhnya dan terasa lah gusi die tu. Still yet, haven't get the chance to find her teether. I don't think it is necessary but just want to avoid her munching her fingers, which may lead sucking her hands. Sudah kurang minum susu botol. Kalau dulu, she would finish 5/6 bottles of 5 oz at her babysitter but since she's entering 4months old, she started to drink less - only 3 bottles a day. Sedih mase awal2 tgk susu tak habis or tgk bwk balik botol kotor 3/4 je tapi lega bile die breastfeed lame when I'm with her. So ok.
Skarang sudah tahu her schedule that her parents will be home around 6pm-ish. Kak Ju (her babysitter) told me that she refuse to milk in the evening (tsk..tsk..) as Rauhah knows that we will be picking her up and I'll be direct breastfeed her at home. She even knows her own home! She will act differently when she's at unfamiliar places. I notice it when we bring her back at Kuantan for holidays. She started to panic at the moment she arrived cause my sister straight away bring her in while I'm busy taking our bag from car. I thought it was just temporary and I let my mom bath her. Die mula meragam and start crying herself, the loudest ever since her birth! It makes me panic when she refuse to calm down after I hug and feed her bak, which normally it would work. I started to think she is sick and try again to hug her longer than earlier. It takes few minutes before she really calm down and a matter of a second before she starts to smile again. 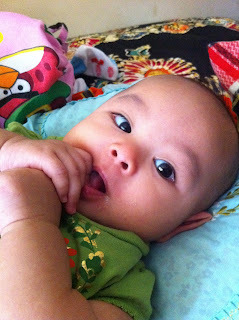 Aih..bikin rungsing ini anak. No more poopoo issue. 2/3 days she'll poops. So ok.
Tidur pun sudah lambat. Tak macam dulu, pukul 7pm dah tidur straight to the next morning. 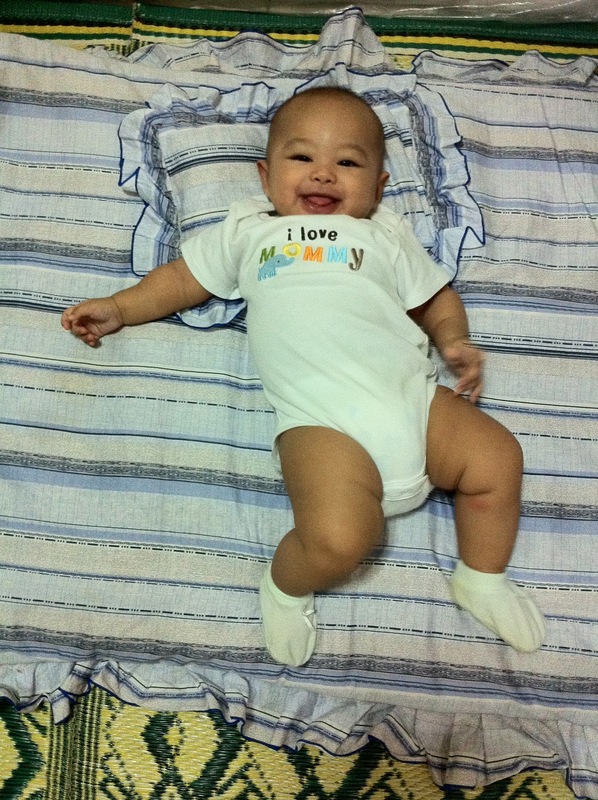 Nowdays, dah tak tentu - she'll play, milk and sleep around 9pm or 11pm! but alhamdulillah, she always sleeps by midnight. Jadi lambat tidur sebab nak main dulu. Hubs pun getting more involve with Rauhah. Kalau dulu balik kerja, die akan layan PC lg lama dr layan anak :P tapi skarang full time with Rauhah, if she needs attention as long that doesn't involve bak. Kekadang jadi risau pun ade kalau senyap je dua beranak ni. Tapi normally this is what they do when I leave them two alone. While he's entertaining Rauhah, I'll be cleaning her bottles, packing her bag for the next day and can do some other chores. My routine also changed. I can finish my housework, dinner, solat and sleep till morning. No more sleep first, house chores later. Yey for me!